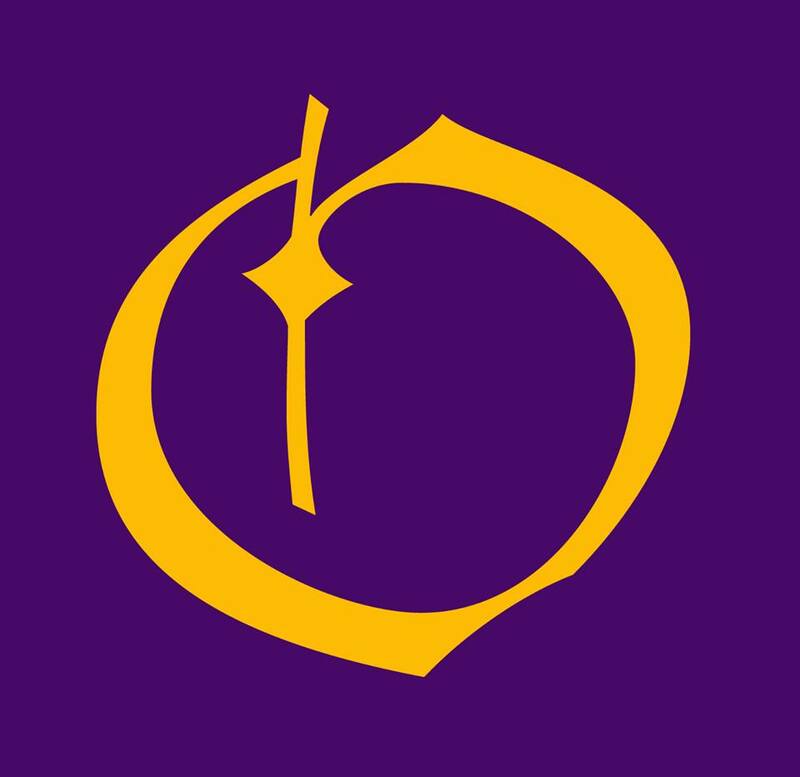 A proposal to create an omnibus peerage for all of the martial activities that fall under the purview of the Society Earl Marshal, with the exception of rattan and rapier, has been sent to the Board of Directors. The name proposed in the Order of Valiance. 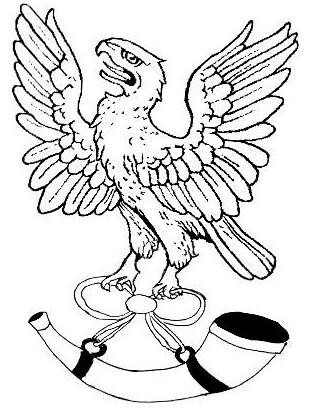 The badge proposed is an Eagle with wings displayed upon a hunting horn inverted, although alternative name and badges were included in the proposal. Regalia suggested is an order medallion. Peerage: Collectively, the members of the Order of Chivalry, the Order of the Laurel, the Order of the Pelican, the Order of Defense, and the Order of Valiance are referred to as the Peerage. A member of any of these Orders is a Peer. The Crown may establish the order of precedence within the peerage according to the laws and customs of the kingdom. However, the orders of the Chivalry, the Laurel, the Pelican, Defense, and Valiance are of equal precedence and must be considered as one group. (c) If in fealty, to support and uphold the Crown of his or her kingdom. (d) To enrich the kingdom by sharing his or her knowledge and skills. 4. The titles listed here are considered standard, and may be used by those who have earned or been granted the appropriate rank or award within the Society. The College of Arms publishes a more extensive list of titles and alternative forms, which may also be used freely by qualified persons. In addition, the College of Arms has full approval authority over new alternative titles, which must be added to their list before being released for use in the Society. Members of the Orders of the Laurel, the Pelican, Mastery of Arms, Defense, and Valiance. Additionally, waive the requirements of corpora Section IV.G. that the Crown consult the members of a peerage order prior to inducting new members of that order, but only in the case of the first three (3) members of the Order of Valiance. Once there are three members of the Order of Valiance in a kingdom, the Crown must consult the Order per corpora prior to adding members. Une proposition pour créer un ordre des pairs regroupant toutes les activités de combat sous la juridiction du Connétable de la Société (Society Earl Marshal) ; à l’exception du combat en armure (rotin) et l’escrime, a été déposée à l’Assemblée des Directeurs. L’Écusson proposé est un aigle aux ailes déployées au-dessus d’une corne (cor) de chasse. Cependant d’autres noms et écussons accompagnent la proposition. L’insigne distinctif est un médaillon. Changements proposés à la Charte concernant l’Ordre soumis. (1) les Membres de l’Ordre de Vaillance peuvent choisir de prêter serment d’allégeance sans que cela ne soit obligatoire. Le candidat devra être considéré comme l’égal des autres Pairs issus des arts de combats soumis à l’autorité du Connétable de la Société (Society Earl Marshal). Le candidat doit avoir démontré l’utilisation de ses talents et/ou connaissances en enseignant au membres et en servant le Royaume. (a) de démontrer une courtoisie et un esprit chevaleresque sur et hors du champ d’honneur. (c) subséquemment à un serment d’allégeance; de soutenir et faire respecter la Couronne du Royaume. (d) de faire grandir le Royaume par le partage de ses connaissances et habiletés. (e) de faire croître le renom et de défendre l’honneur des Pairs, qu’ils soient Seigneur ou Dame. (f) d’informer la Couronne du progrès des candidats à l’Ordre de Vaillance. 4. Les titres présentés ici sont considérés comme standards et peuvent être portés par ceux ayant mérité ou ayant reçu le rang ou la décoration dans la Société. Le Collège des Héraults (College of Arms) a publié une liste complète des titres et de leurs équivalents culturels, qui pourront être utilisés par les personnes méritantes. De plus le Collège des Héraults (College of Arms) possède toute autorité pour définir de nouveaux titres alternatifs qui devront être ajoutés à la liste, déjà existante, avant d’être publiés pour utilisation. Abroger temporairement la Section IV.G de la Charte Corporative (Corpora) définissant la consultation des membres de l’Ordre précédemment à l’intronisation d’un nouveau membre et ce pour les 3 premiers membres introduit dans l’ordre. Lorsque l’Ordre de Vaillance sera composé de 3 membres dans un Royaume, la Couronne devra obligatoirement consulter pour la sélection d’un nouveau membre, le tout, tel que défini dans la Charte Corporative (Corpora). The Aethelmearc Gazette reports that a final proposal to create an omnibus peerage for all martial arts under the purview of the Earl Marshal, with the exception of rattan and rapier, was submitted to the Board of Directors today. To read more about the proposal including where to find its full text, see the article at the Aethelmearc Gazette. Greetings unto the populace of the East Kingdom. 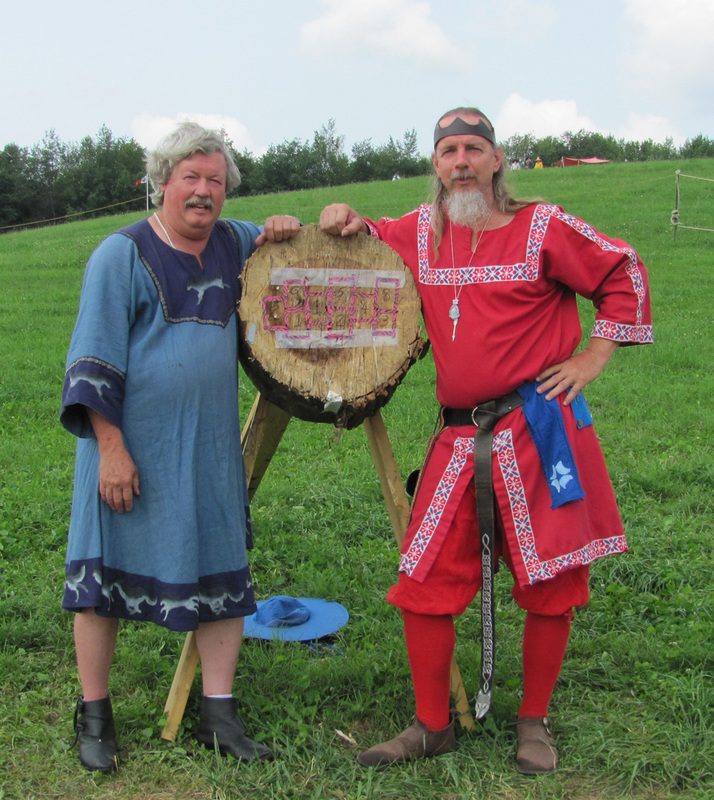 The Shire of Glenn Linn would like to extend an invitation to attend Northern Region War Camp, July 2-5, 2015. We will be in a new, much larger location at the Washington County Fair in Greenwich, NY. This year we will have heavy list, youth fighting, rapier for adults and youth, archery, thrown weapons, equestrian, Royal court, A&S classes, merchants, and merchant demonstrations. With a theme of “assassination” this year’s war camp promises to be a fun event for all. As this is a new site, we are trying a new process to make check in and camp set up occur as smoothly as possible. We are now taking reservations for individuals and groups. We have campsites near the fighting, near rapier, and near equestrian, as well as general camping near water and electric. We even have two household sites still available. Although reservations are not necessary to attend NRWC, they may help you camp near your preferred activity. Campsites are offered on a first come, first served basis. If not, you soon will. It is being worn by anyone who wishes to show they support the creation of an omnibus — or umbrella — Peerage to recognize non-rattan martial prowess. It is also being used as (or added to) avatars and profile pictures in various social media. The badge was created by the Martial Peerage FaceBook group as a way to promote awareness of the movement. Editor’s note: The badge graphic — and variants for different martial interests — was designed by Mistress Ysabeau Tiercelin of AEthelmearc. On Thursday (Aug.7), two teams of twelve assembled on the range to settle the Thrown Weapons Champions Team war point. The East prevailed with 119 points over the Midrealm’s 85 points. Robert and Paganus, valued allies! The top individual scorer of the contest was Master Robert of Wilford with 16 points; he was an Eastern ally from An Tir. Another ally, Baron Paganus Grimlove from Caid, tied for second-highest score with 15 points. Both champs said it was a challenging competition, and they are shown with one of the toughest targets. 1 point each for Thrown Weapons and Siege. The schedule for the war points is listed below. Battle details can be found here but more information will be forthcoming, so check back again as we get nearer to the event. 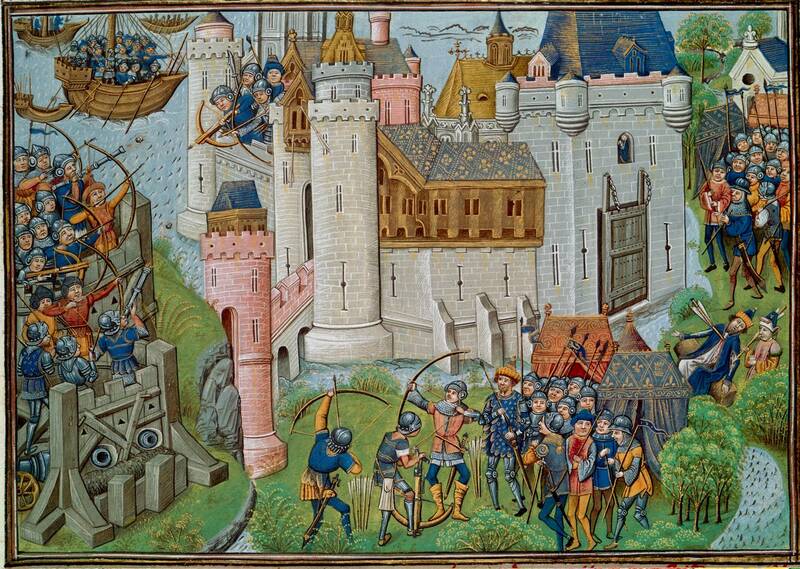 On a fine October day, the Endewearde Hunt for the Unicorn took place. Many activities were enjoyed: A&S classes seemed to be enthusiastically attended, the hurley players had a great time, the children conducted a successful cattle raid, the thrown weapons range was always busy, and many people participated in archery. There were 18 Endeweardian archers who participated in the baronial challenge, which was finally won by Lord Eoin an Doire. Baroness Aneleda’s Enchanted Ground was attended by about ten people who shared poems, songs, music and stories and Aneleda gave brooches made by her to all those who came. New people added their voices to singing around the fire on Saturday night, and Papa’s Bar at the End of the World did a roaring business. The Brewers’ Round Table was attended by brewers of all degrees of experience and Sylvia thought it went very well.